Kadence has a large number of board level products for NAS(Network Attached Storage), SAN(Storage Area Network), RAID, JBOD and other storage applications. A small subset of over 95 different boards we have developed from 1993 to present is shown under its respective category. 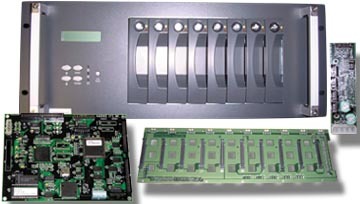 In addition to the board level hardware products, Kadence also has a rich suite of OEM embedded solutions (High Speed Controller for the pre-press and printing industry), an Air Mattress Controller(AMC) with integrated A to D Converter, Fibre-Optics/LED Controller for architectural lighting, Windows Blinds Controller for up to 64 windowws, firmware modules, Device Drivers , and Diagnostics software, developed in-house as part of providing a complete solution to our customers. If you don't see what you're looking for, chances are we have the technology to provide you with the required solution NOW! Please call us at 949 472 4530 or send us an email at info@kadencesystems.com. Our specialty is building what you need.